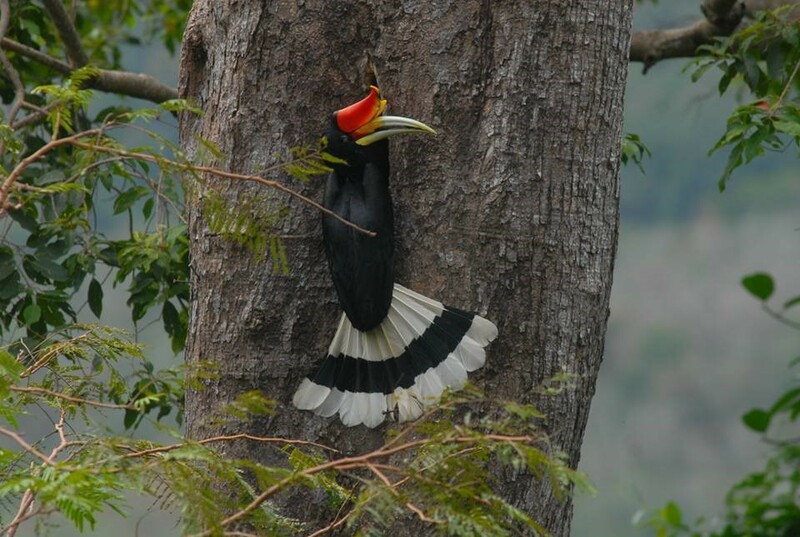 In the Yhaweh language of southern Thailand the Rhinoceros Hornbill (Buceros rhicoceros) is called “barong balong” barong meaning bird, balong meaning rhinoceros. The Rhinoceros rivals in size with the Great Hornbill (Commonly referred to as “Kahang” by Thai villagers) and both birds emit a similar “kok kok” cry as well. But unlike the Great the Rhinoceros has a majestic upward curved casque that resembles the curved horn of Rhinocerous mammals. The male Rhinoceros Hornbill is distinguished by a vertical black streak on its yellow casque as well as a red diaphragm around its eyes. The female on the other hand does not have a black streak and the diaphragm around the eyes is white. 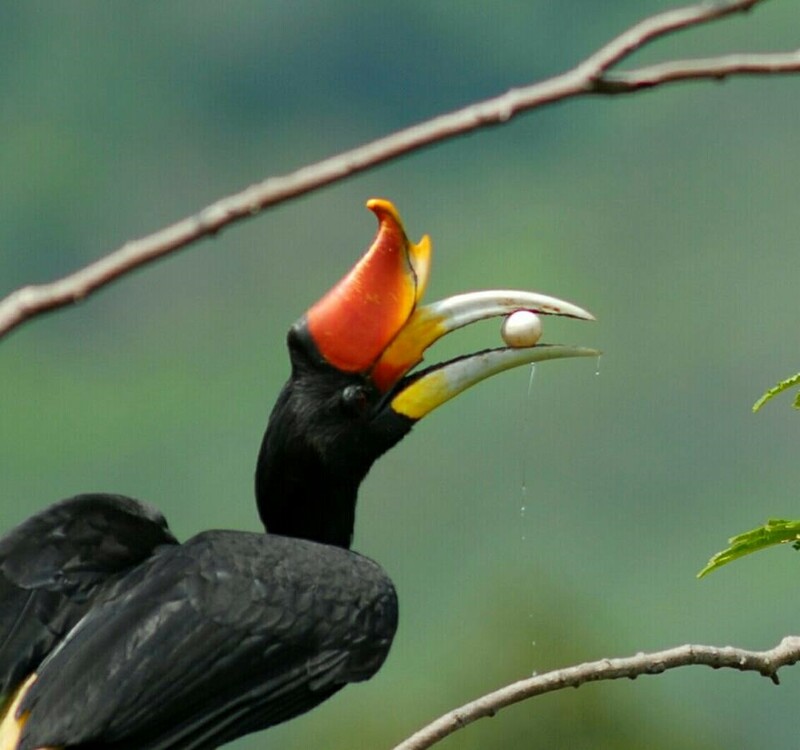 The Rhinoceros Hornbill is one of the most colorful of the 13 species of Hornbills endemic to Thailand with a distinctive feature that never fails to capture the imagination of viewers who see it for the first time. Scar Face, the owner of the kalor tree following the law of the Jungle. 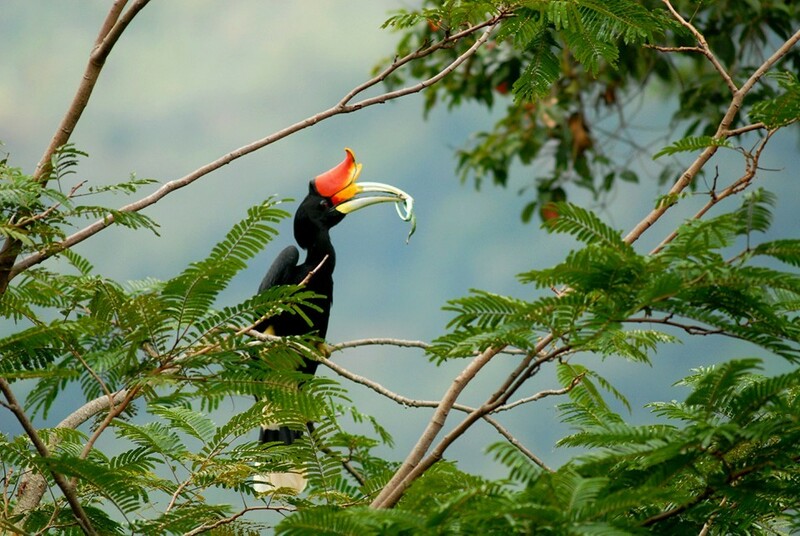 The Rhinoceros Hornbill features as one of the Hornbills found in the Budo mountain range of Southern Thailand, but not long ago the Rhinoceros Hornbill became almost extinct from those mountains due to widespread poaching. 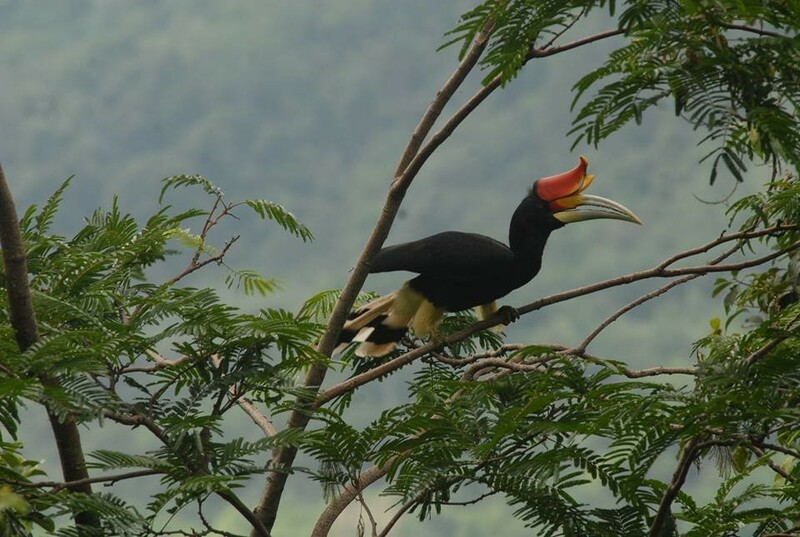 The species may have been saved by a joint project started twenty years ago between the Thailand Hornbill Project of Madhidol University and volunteers from the 13 villages surrounding the Budo mountain range, in which former village poachers were convinced to help look after these birds so that their children and descendants would be able to grow up alongside these majestic birds. Among the several Hornbill nest cavities being looked after by the joint research team is nest number 29 high up on a “kalor” tree (Shorea sp.) 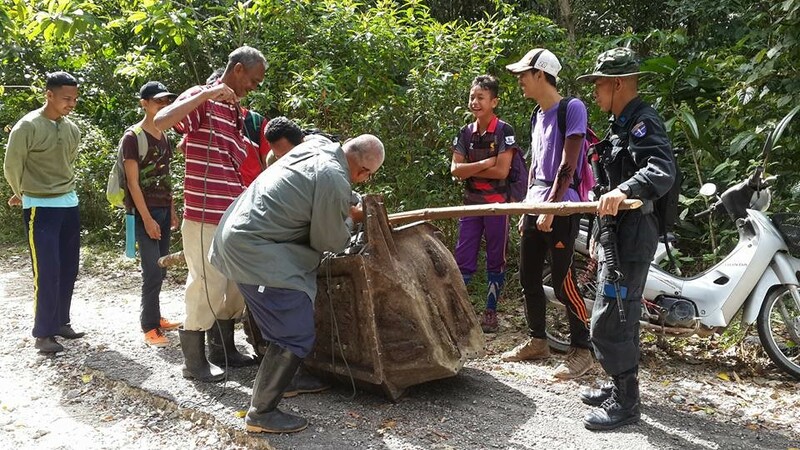 on top of “Fish Hill” located at an elevation of 100 meters above sea level and inside a forested area made up of rubber plantations and fruit orchards belonging to villagers. Nest number 29 seemed to be the favorite nest cavity of a Rhinoceros Hornbill pair with the male having been given the name of “Scar Face” because of a gash visible on his yellow casque. Access to the nest takes half an hour from the nearest road, after wading through a shallow creek and climbing across an enclosure to keep out cows. 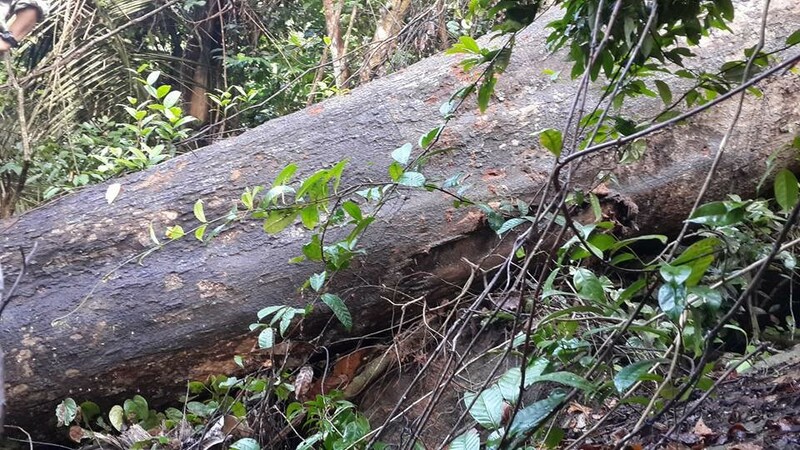 It has been more than ten years since our Hornbill Team has been watching Scar Face and his mate use this tree cavity as their nest and produce ten offsprings. But then in 2015 a poacher climbed up the kalor tree and stole the chick from the nest cavity to sell it in the black market. Scar face with its catch, a green Tuk-kae snake, as an enticement to his mate as part of the courtship ritual during the mating season. In the early days of the 2016 mating season the same Hornbill pair came to inspect nest cavity number 29 again. 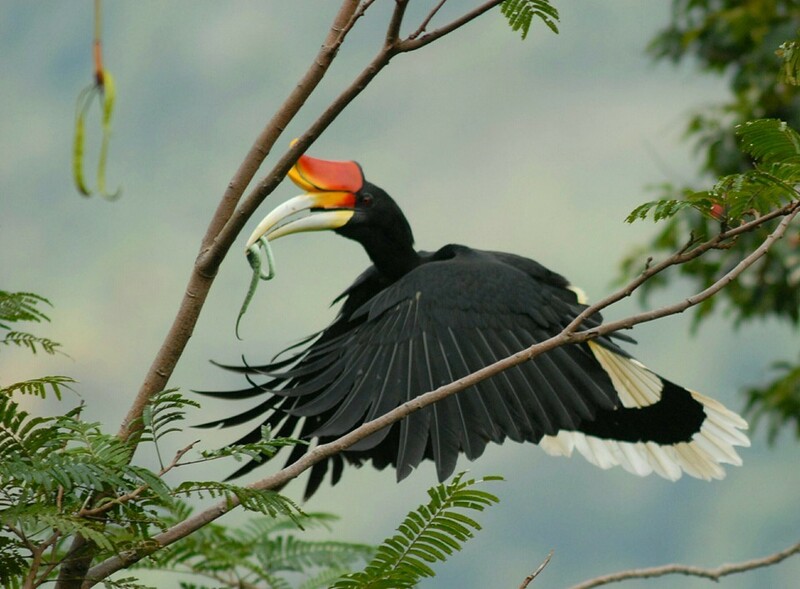 The Hornbill Team watched as Scar Face started going through the yearly ritual of enticing his mate to enter the nest by showing its prowess by catching a green tuk-kae snake, a favorite delicacy of hers. She seemed to have made up her mind and flew to the nest, perched close to Scar Face and then moved to the nest cavity to have a look inside, then she came back close to Scar Face, perhaps to send a secret signal before gliding down into the valley below immediately followed by her mate with his bill still holding on to his catch. As the Team observed the pair in anticipation the team saw Scar Face hunting for other types of delicacies for his mate such as spiders, flying geckos, flying squirrels, birds’ eggs, a young lizard, but to no avail. The female refused to breed that year. In April 2017 Scar Face returned again in to nest cavity number 29 and perched on the kalor tree with a throat-full of fruits but saw something unusual at the nest entrance. It was a giant lizard scavenging for food and going in and out of the cavity. Scar Face considered the situation for a moment and suddenly flew in to attack the intruder with its bill causing the giant lizard to seek safety into the tree cavity. Scar Face continued its attack on the intruder but then flew off to perch on a nearby tree before flying off and disappear into the valley below. A short while later the giant lizard made its way out of the tree cavity while Scar Face flew back and perched on the back side of the nest cavity while the female was perched nearby. 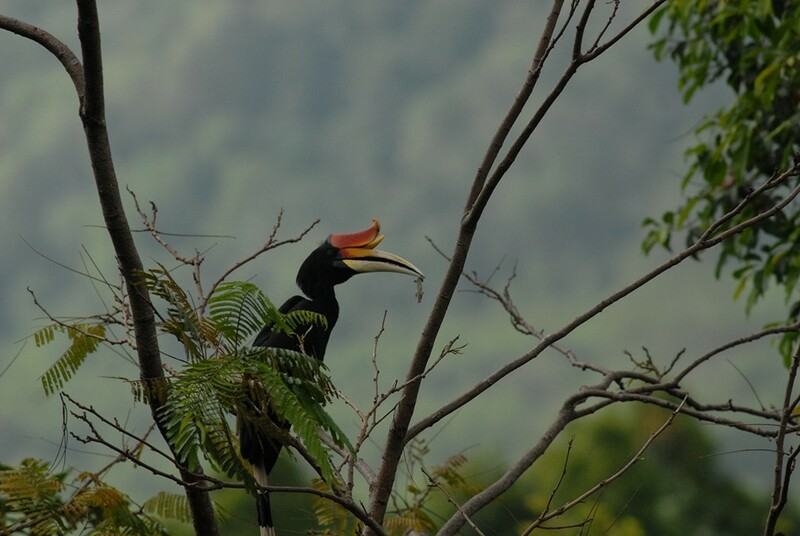 The Hornbill pair remained there for a long while before flying off in different directions with different but synchronized cries reverberating throughout the fruit orchard. The female had refused to enter the nest cavity because of the danger. I felt great pity for Scar Face who was all the more eager as can be to mate. But the female had the final say. Whether the courtship was disrupted by human beings or by the giant lizard life was difficult for Scar Face who was unable to produce a Rhinoceros Hornbill offspring that year once again. Catching a white belly flying squirrel. 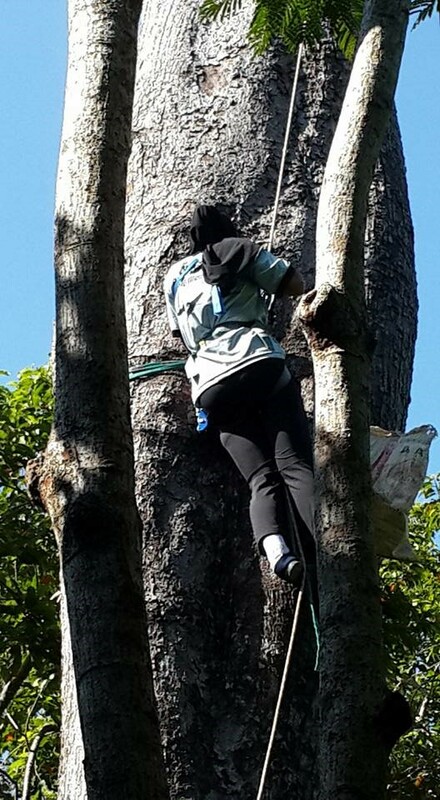 Therefore in September 2017 at the end of the breeding season myself and village research assistants climbed up the hill to the kalor tree to inspect nest cavity number 29. We discovered that the entrance of the nest cavity was slimmer than it should be, we chiseled the excess wood out of the cavity entrance and we added 150 kilograms of soil into the cavity to allow the female and her chick to receive food from the male more conveniently. Proper leveling of the floor cavity allowed the female to defecate directly from the nest cavity. Unless such requirements are met the female will not enter the nest cavity. 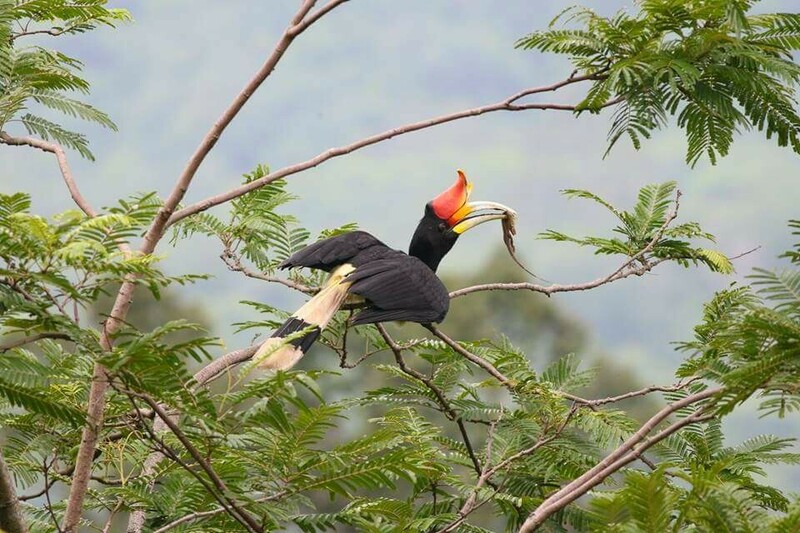 The Team was hoping that the 2018 mating season would produce a Rhinoceros Hornbill offspring as the nest cavity seem to be in good condition. But a most unfortunate turn of events occurred. On 8 January 2018 as I and Sari Han, the local research assistant in charge of nest site number 29, walked up to the hill overlooking the kalor tree we no longer could see the tree. As we walked to the actual location we discovered that the entire tree truck had fallen down. 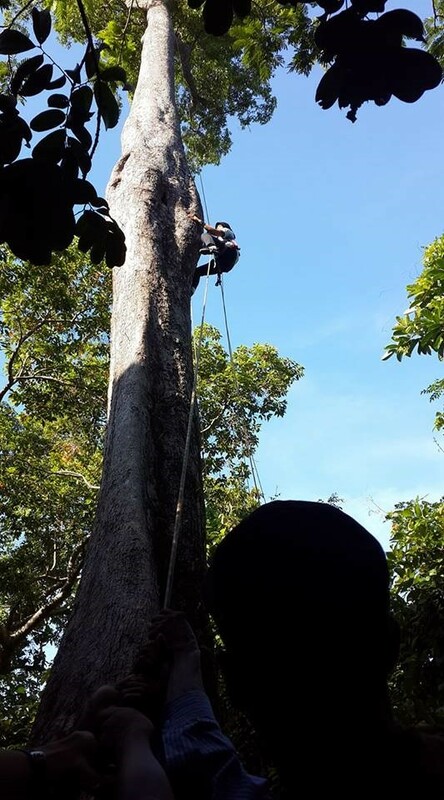 It was fortunate that the female Hornbill hadn’t yet taken residence in the next cavity, and that the tree hadn’t fallen down while a Hornbill Team members was in the process of climbing or working around the tree. Scar face picking fruits as an enticement to its female to mate. In order to give Scar Face have another chance at producing an offspring the Team thought of a way out by installing an artificial nest on a tree adjacent to the fallen kalor tree. 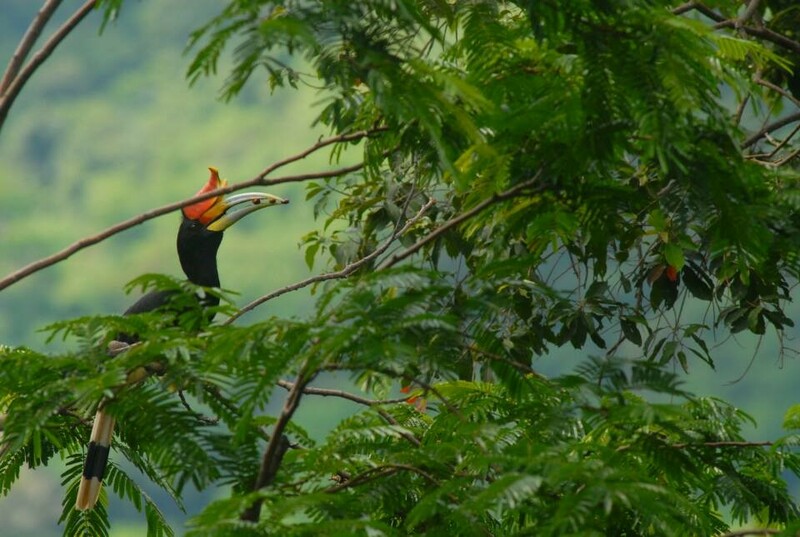 The Team felt his new arrangement could re-ignite the interest of the Hornbill pair to return and mate again. 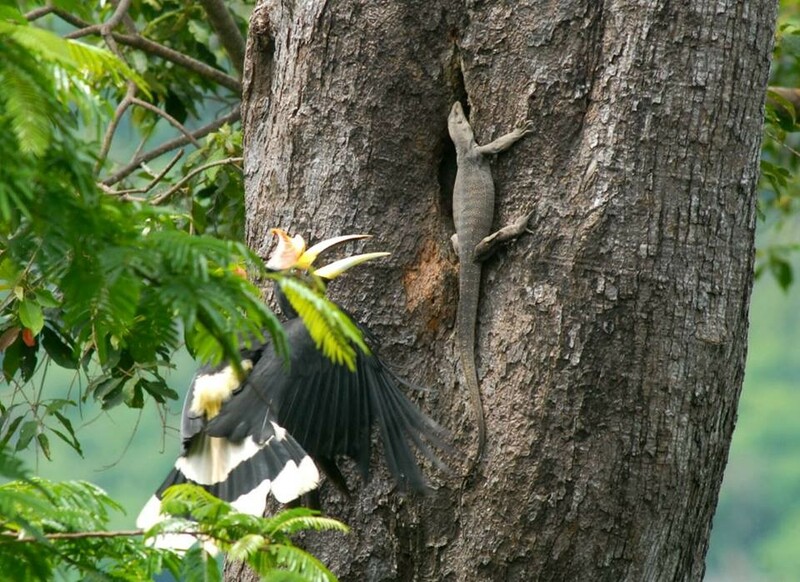 Scar face flying in to attack a giant lizard, one of Hornbills’ natural enemies, near the nest cavity causing the female to fear for her safety and refuse to enter the nest. Narihan Da-Ali climbing up to nest cavity number 29 belonging to the Rhinoceros Hornbill pair, with Sari Han Panoh, the local research assistant in charge of the nest site, looking on. 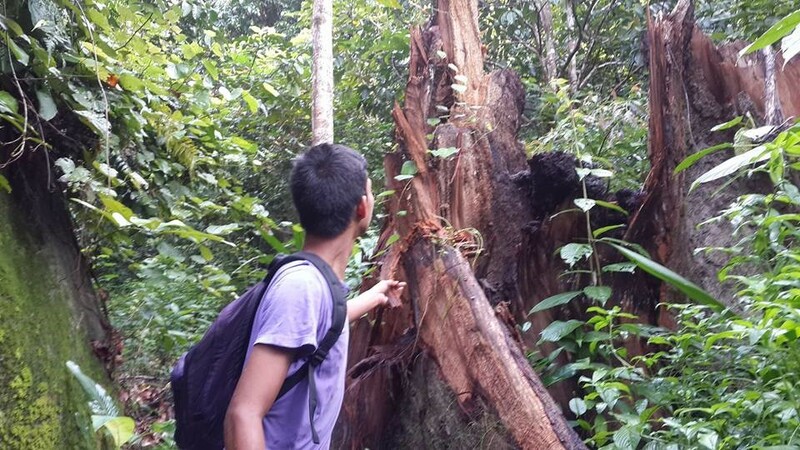 The felled kalor tree, the nest cavity number 29 host tree. Scar Face flying in the vicinity of its old next tree while the Hornbill Team was carrying the artificial nest prior to installing it high on the trunk of an adjacent tree. 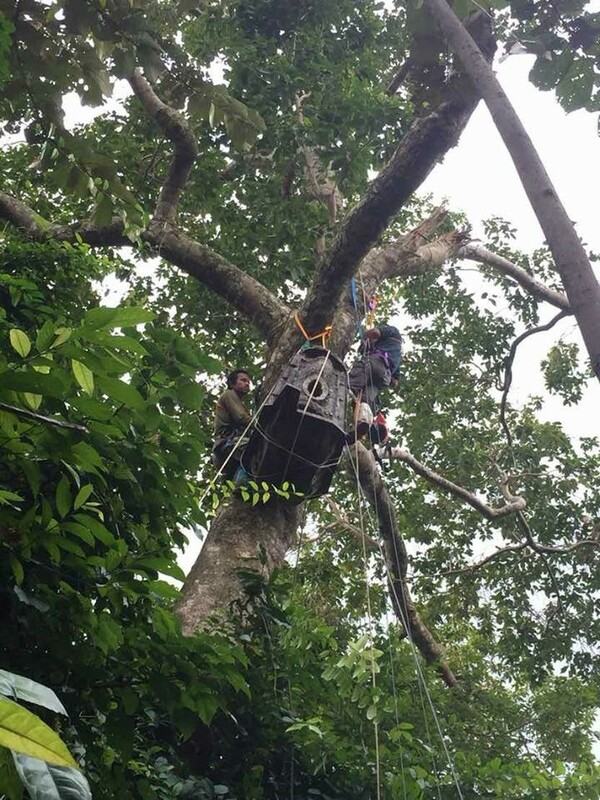 On 1st of February 2018 as villagers, army rangers from the Pe-Cho Waterfall Camp way carried the artificial nest to the site and lifted the nest on the tree adjacent to the original kalor tree we could all hear the cries of Scar Face and his mate flying nearby looking for an appropriate nest cavity for this year’s breeding season after discovering certainly with dismay that its favorite nest cavity had disappeared. 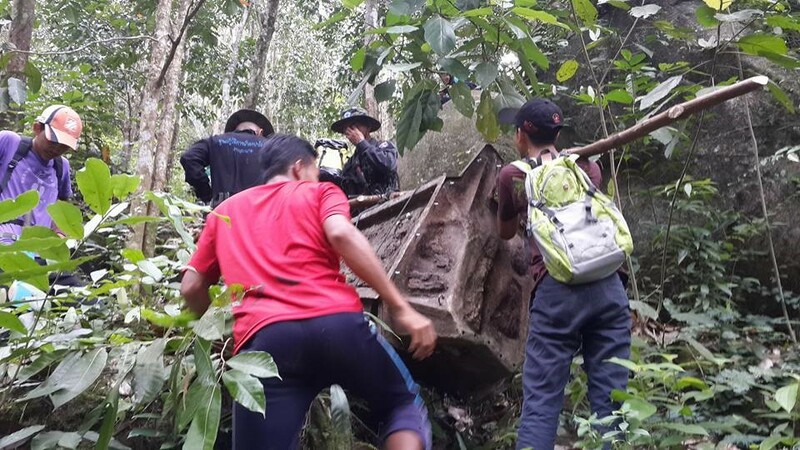 Villagers and army rangers from the Pe-Cho Waterfall Camp prepare to carry the artificial nest up Fish Hill through difficult terrain and high elevation. 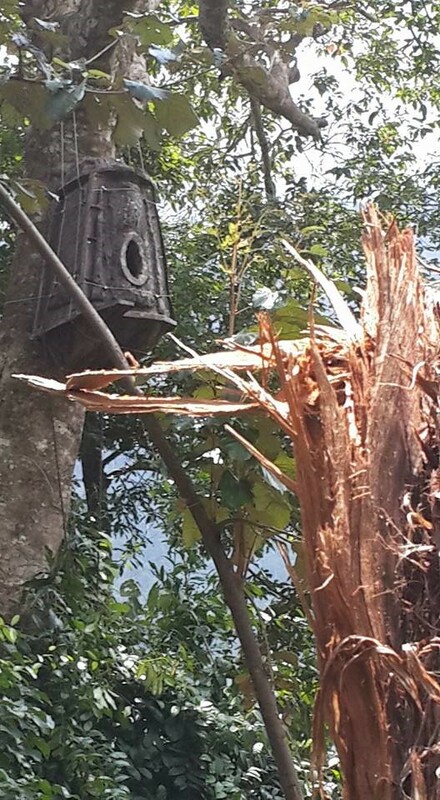 The artificial Hornbill nest in place on a large tree adjacent to the recently fallen kalor tree. 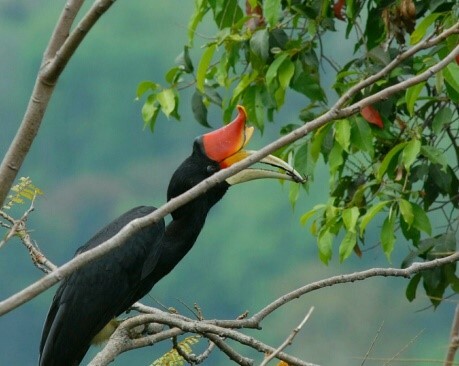 However there have never been a recorded success of Rhinoceros Hornbills choosing a nest site in an artificial nest and producing an offspring. 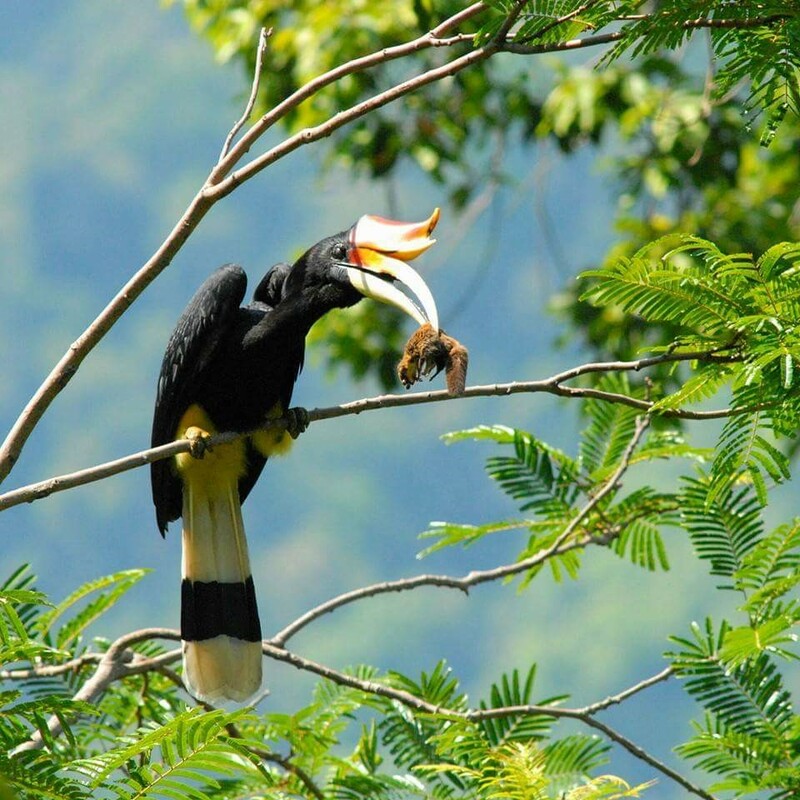 The Hornbill Team is monitoring the artificial nest and should Scar Face’s mate agree to lay eggs in it and produce an offspring it would bring a great deal of joy and satisfaction to the Hornbill Team and all involved.